Every year in my high school geometry class, I set aside one day as Snowflake Day, usually the day before Thanksgiving Break. 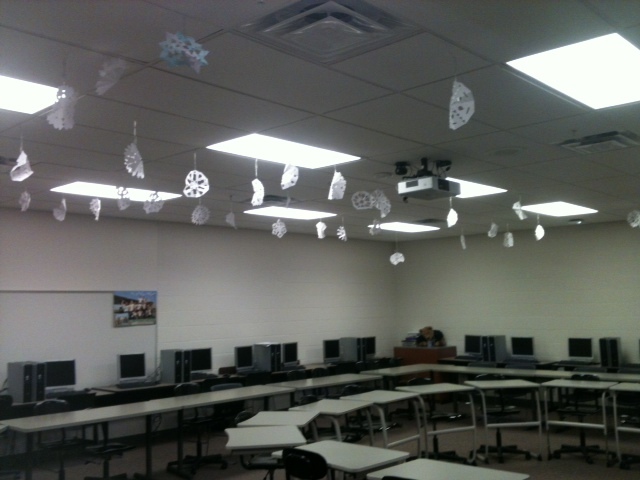 One of the many reasons I love teaching geometry is that it lends itself to special days like Snowflake Day. You start with a rectangle, folding and cutting it into a square followed by an isosceles right triangle and then a reduction of said triangle, finally dividing it all into thirds and then randomly cutting the tightly folded polygon into a one-of-a-kind paper snowflake. It never fails, no matter what age, everyone is amazed at the snowflake they unfold. This year each student was required to write his or her name on at least one snowflake to be hung in our classroom as a reminder throughout the winter season that each is special and everyone matters! “You are unique. You are special. YOU MATTER,” I told them. As snowflakes were made and displayed around our classroom, I encouraged students to share snowflakes with friends and family by writing thank you notes on the gifted snowflakes letting the recipient know YOU MATTER. Finally, as Snowflake Day came to a close, I asked my students to share about something for which they were thankful. Students lightheartedly talked about family, friends, or football. All but Johnny, that is. Just as the bell rang, Johnny, a student whose second day back after an extended medical leave was Snowflake Day, looked at me and quietly shared he was thankful for waking up. Though snowflakes were displayed all around our classroom, Johnny put his on my desk and said he’d rather that it not be displayed. Later that day as I admired Johnny’s snowflake, I found he had written a note. Even high school students enjoy making snowflakes!